Suncheon-si, Tuesday 10 September, 8am. After the rich variety of the hanjeongsik food the previous evening, the buffet breakfast at the hotel offered comfort for a lazy western palette. I could have had some Korean food – miso soup, noodles, rice, the normal offering – but instead I went for toast, omelette, frankfurter, and tomato ketchup. A bit of strong black coffee would have been nice, but “mixed” coffee (instant, with milk and sugar), was the only variety available. Instead, unlimited orange juice helped start the rehydration process to mitigate the effects of yesterday evening’s soju. We can see that it’s scorching hot outside, and we’re going to get seriously sweaty walking round the Garden Expo this morning, so we negotiate a late check-out time with the hotel front desk so that we can take a shower after our morning of horticulture. We set off on the 10 minute stroll to the Expo entrance, armed with umbrellas to serve as sunshades. The Expo office still hasn’t returned our call, so we will not have the benefit of a guide. 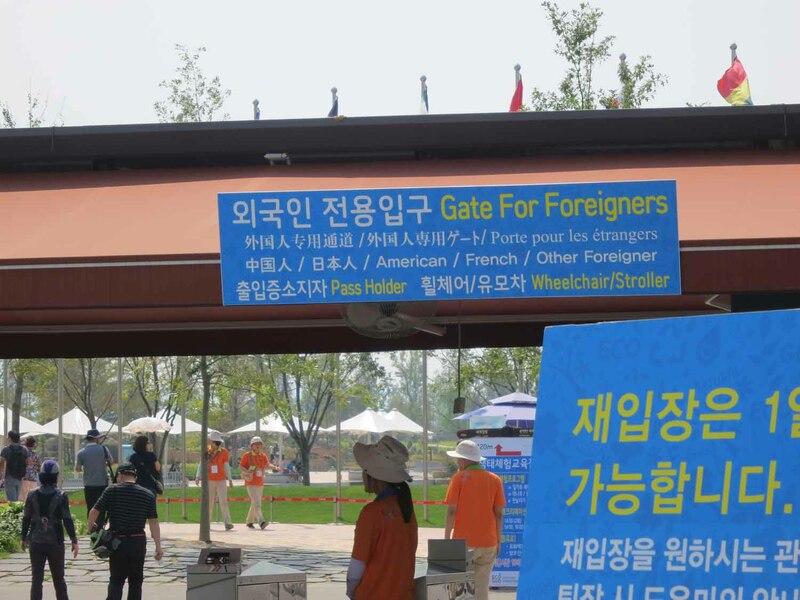 At the entrance to the Expo, Americans, French and “Other Foreigners” get their own special ticket barrier, and once inside there’s a special kiosk to welcome you. We stop to chat to the people behind the desk and fortunately they are a lot more welcoming and helpful than the folks back at the office. They agree to get together a press pack of materials, including a glossy hard-back book about the Expo, while we wander around. And as it turns out, we’re very happy to do this at our own pace, without a guide to hurry us. As it was September, and the Expo had been going on since April through the long hot Korean summer, I wasn’t expecting to see much in the way of floral colour. Nevertheless, the rose garden is full of blooms, and there are many other borders benefiting from plants such as celosia which are sturdy enough to survive the heat. Sensibly though, one of the main features of the Expo is something which involves no flowers at all: a lake which has been landscaped with islands and mounds that match the shape of the hills surrounding Suncheon. Water, grass and bridges combine to form a harmonious composition which forms the centre of the whole area. The designer of the Suncheon Lake Garden is Charles Jencks, an American landscape architect based in Scotland. His creations are known for their curves, swirls and spirals. A good example of his work in Britain can be found in the grounds of the Scottish National Gallery of Modern Art in Edinburgh. But in Suncheon, the scale is much larger. Here, the spirals in his design are turned into paths which circle around the artificial hills, which float like islands in and around the large central lake, and are connected to each other and the mainland by curved wooden footbridges which harmonise perfectly with the curves of Jencks’s landforms.